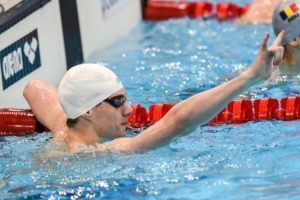 Tonight’s action will feature a battle between ACC Record holder Hennessey Stuart and Championship Record holder Grigory Tarasevich in the 200 back, but Robert Owen may also challenge for the title in that event. The final preliminary session of the 2017 men’s ACC Championships is upon us, with heats of four events followed by timed final heats of the 1650 free and qualifying rounds of platform diving. NC State has a commanding 100-point lead over Louisville, but competition is still very live for spots #3-#12. NC State and Louisville battled for the gold, with just .12 separating them at the finish. During the entire duration of the race, they were never separated by more than 3 tenths of a second. 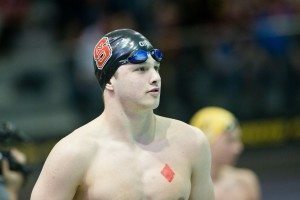 NC State’s Andreas Vazaios rocked a nation-leading 1:41.25 to reel in a conference title on Tuesday night at the 2017 Men’s ACC Championships in Atlanta, Georgia. 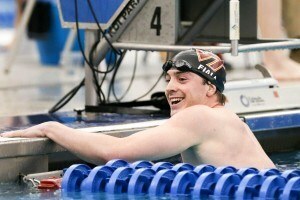 After just missing the ACC Record by 2 hundredths in prelims, he took it down tonight by almost 7 tenths. 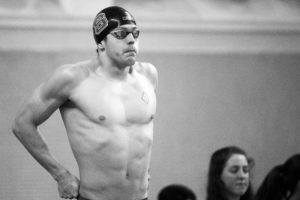 The former record stood at a 1:41.92 done by Florida State’s Pavel Sankovich in 2014. Vazaios now sits just outside the top 10 performers of all time, as his time puts him one slot behind 10th-ranked Chase Kalisz. Before tonight, Kalisz was the fastest swimmer in the country this year with his 1:41.30 from the 2017 SEC Championships. The 2 men now head to NCAAs separated by just a hundredth. Crazy how fast this event is getting. Actually, how fast college swimming is getting in general. This looks like it’s going to be one of the closest races. It will probably take a 1:42 low to make the A final. I think Murphy and Licon get under 1:40, but there are several other guys that will probably be under 1:40. I’m sorry but… it says 1:40.25 in the rankings where he is put 11th, yet Vazaios went 1:41.25. I’m not missing something am I?